(TibetanReview.net, Oct23, 2015) – China’s Foreign Ministry has, on Oct 21, said Prince Charles’s skipping of the royal banquet with Chinese President Xi Jinping was “not rude”. However, its official media has hit out at him, saying “Charles chatter” will not affect the burgeoning Sino-UK ties, reported India’s PTI news agency Oct 21. Hua has expressed belief that there were reasons why Prince Charles did not attend the Oct 20 state dinner. However, while Hua was guarded in her reaction to Charles, Global Times, the global edition of China’s party mouthpiece People’s Daily has hit out at the Prince in an editorial titled ‘Charles chatter won’t affect Sino-UK ties’. 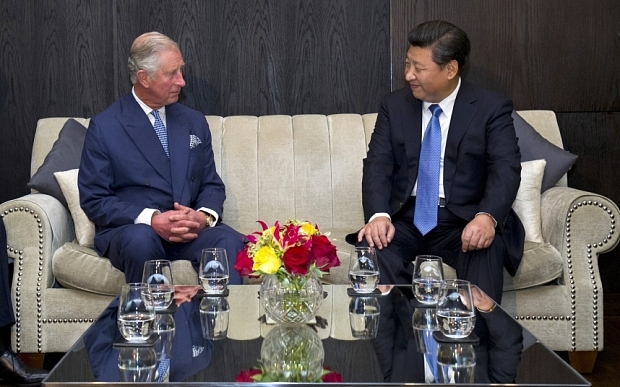 British media reports have suggested that Prince Charles skipped the banquet as he had done with the Chinese leaders in the past due to his close friendship and association with the Dalai Lama, whom China considers a separatist. During the current visit, Prince Charles did meet Xi and his wife Peng Liyuan separately, although details about it remain unknown. Besides, he also attended several activities to welcome Xi on Oct 20. The Global Times report suggested that “most people won’t read too much into it”. “The Western media would fail to direct public attention toward Prince Charles’ skipping the banquet because the influence of the significant China-UK “golden era” cannot be jeopardised,” it added. The editorial did note that Prince Charles had declined to meet with the Dalai Lama recently because “most elites in the UK are aware that Xi’s visit bears an unusual and historical significance and means more to Britain” and that the prince was better aware of that.